After finishing All the Light We Cannot See, I’ll confess I was a bit addicted to Doerr’s lovely writing. Since we were about to take a trip to Rome, I thought I would pick up this travelogue about Doerr’s year in Rome as a creative writing resident. He describes the city with love and nostalgia, capturing Rome at its funniest and most breathtaking. It’s difficult to say something new about a city that has captured imaginations for millennia, but Doerr manages to do so in this story of an Idaho couple with two toddlers who are thrust into Rome for a year. Again, this is a book you read for the writing. Doerr really knows how to craft a scene and turn a phrase. This is a lovely and enjoyable travelogue from an American writer who spent a year in Rome on a fellowship. I picked it up not just because I like travel memoirs, but also because I recently read Anthony Doerr's excellent novel All the Light We Cannot See, and he had been working on that book while he was in Rome back in 2004.Doerr and his wife moved to Italy when their twins were newborns, so besides the travel vignettes and insightful comments from a writer talking about the process of writing, there are also adventures in parenting in a foreign country. Additionally, Pope John Paul II died while they were in Italy, and Doerr marveled at the millions who flocked to Rome for the pope's funeral. In short, there's a lot of interesting stuff in this 200-page travelogue. Doerr is an engaging writer and I enjoyed following his journey. Recommended for those who like stories of Italy or books about writers and writing.Favorite Quotes"We came to Rome because we'd always regret it if we didn't, because every timidity eventually turns into regret. ""The only way to fall asleep is to stop trying to fall asleep. Sleep is a horizon: the harder you row toward it, the faster it recedes. [on visiting the grave of John Keats] "We are hemmed by brickwork, ivy, history. A line from a Tom Andrews poem comes back to me: 'The dead drag a grappling hook for the living. The hook is enormous. '""A good journal entry — like a good song, or sketch, or photograph — ought to break up the habitual and lift away the film that forms over the eye, the finger, the tongue, the heart. A good journal entry ought to be a love letter to the world. ""I agree to live now, live as sweetly as I can, to fill my clothes with wind and my eyes with lights, but I understand I'll have to leave in the end." Humorless self-important dude lives in Rome for a year with his wife and newborn twins. Dude muses about Rome. Dude muses about history. Dude muses about parenthood. Dude muses about musing. Dude thinks that writing short sentences and fragments makes. The banal. More interesting. Dude's wife passes out from exhaustion and dehydration because she's been taking care of the twins by herself while dude muses. Dude muses about this for a while before he takes her to the hospital. Dude muses about the Pope. Dude muses about leaving Rome. Dude and family go back to Boise, where I hope they get a nanny. What a book ! Sensual, Captivating and beautifully written. Anthony Doerr finds himself in the heart of Rome shortly after his twin boys were born. Having received the Rome Prize, an award that gave him a year-long stipend and studio in Rome he embraces the adventure and moves his family to the Eternal City. I loved so much about this book, the writing is poetic, lyrical and so vivid, the author's descriptions of Rome through the seasons are breathtaking. This is a short read at 205 pages but Doerr never wastes a word as we walk through the streets of Rome with him and his enviable stroller containing two delightful and demanding babies. We see life in a small apartment with his wife and children and how they try to adapt to the language and customs of a foreign city where life takes on a new meaning as well as challenges. I loved the snippets of history of Rome sprinkled throughout the book and I spent almost every chapter googling places and buildings and really enjoyed this eloquent and witty little book. His descriptions of people he met on the streets on a daily basis was so vivid and real. All in all a suprisingly uplifting and delightful read and a lovely little escape to a city full of life and history and intrigue. On the day that his twin sons were born, Anthony Doerr received a letter informing him that he had won the Rome Prize. He was given a small apartment, a studio at the American Academy, and a monthly stipend to spend a year writing in the Eternal City. Six months later, he and his wife bundled up the twins and flew from Idaho to Italy.Doerr writes about the challenges of parenting twins, especially the lack of sleep, and the love he feels for them. Communicating in Italian is another difficult task, sometimes with humorous results, and other times frightening as when he needed to get medical help for his wife Shauna. During the year the author read all 37 volumes of Pliny's "Natural History" (from AD 77) as well as many other works about Rome. His family walked and rode buses through the city with a twin stroller, marveling at the beauty they could find. The whole area of Rome and the Vatican is really a huge art museum. They were also witness to the events at Saint Peter's Square when the Pope died and another Pope was chosen.Doerr is a keen observer of both people and nature. His lyrical writing is beautiful, and draws the reader in to experience Rome through his eyes. "Four Seasons in Rome" is an especially enjoyable travel memoir. I have a love affair with Italy having had the great fortune to visit it two years in a row (2010 and 2011). Venice and Florence were easy falls/love at first sight, Rome not so much. Needless to say spectacular even the first time around (it is Rome after all! ), it was much more rough and tumble -- requiring more from the tourist... a bit of work, having to earn it a bit (or a lot) more than the other two locales. But on the second time around, the city easily revealed its charm almost immediately. I knew my way around and was prepared and ready for the grit, the bustle, the attitude. I was pretty prepared to hate, or at minimum, at least be pretty darn bitter about Anthony Doerr's Four Seasons in Rome. How could I possibly even like this guy who won a literary prize that awarded him a full year in the Eternal City with room, board, and a salary just to work on his craft?! But alas, Doerr defied the odds and right from the start I found myself not only *not* hating him but even liking him. So while the "win a trip to Rome for a year" premise is still pretty annoying, I think what helped things out was that this was not one of those travel memoirs where the person is trying to "find themself." Not that there is anything wrong with that, was/am a big fan of the mother of that genre -- Liz Gilbert's Eat, Pray, Love -- but that's very "been-there, done-that" at this point, though any personal tale of travel and particularly living abroad is a life-changing/altering experience. Rounding out the non-hate, was that he and his wife moved there with 6-month old twin boys. Being a childless person, that's enough of a personal nightmare for me anywhere in the world, let alone doing it halfway across the world where I don't speak the language. Finally what was particularly endearing, was that Doerr does not end up doing much productive writing as, no surprise, Rome and new fatherhood both end up being two pretty darn big distractions! I only became aware of this memoir having recently read Doerr's first novel, All The Light We Cannot See which appears to be what he fully and well-intended to work on while in Rome, but it appears that a short story and this book from his journal were the end-products of that year abroad.I am giving the book an unofficial 4.5 stars, it really struck a chord with me and I relished most every moment of it -- tacking on my sheer/pure sentimentality/love for Italy and Rome, giving it the Goodreads bump up to 5 stars. Doerr is a helluva writer and beautiful captures the magic and spirit of this ancient city. His quite literary (but always accessible) prose might get a bit eye-rolly at times, particularly to the Rome uninitiated, but for me it is a city that deserves all the florid language and languishing descriptions. It certainly elicited audible sighs or side-smiles from this reader. Superficiality doesn’t run much deeper than this: If you know next to nothing about Italy, are never planning to visit, and are perfectly content to allow your impressions of the country be informed by *Under the Tuscan Sun*-like romanticism and shameless, treacly sentimentality, then *Four Seasons in Rome* is the travel book for you. Otherwise, Doerr’s constant doses of high-sugar, low-fiber commentary about his and his family’s year in Rome are only going to have you reaching for your insulin pen. Are we really (I mean, are we REALLY??) still at the stage where someone can publish a book about Italy in which his entire contribution to the genre is to rehearse postcard stereotypes and Merchant-Ivory clichés? Call me simple, but I’d truly have thought the market was completely glutted with sixteenth-of-an-inch thick observations on how “wonderful” and “beautiful” Italy is—made by people who don’t speak the language, who never stop being tourists, and whose apparently unlimited financial and other resources insulate them entirely from the realities of Italian life. Being a casual visitor is a fine and respectable pastime, but it doesn’t qualify you to write a book. Doerr, however, is undaunted, awhirl in whimsy and wide-eyed wonder. From his innocent astonishment that tomatoes actually taste good (he does live in Boise, Idaho, after all) to his tired (and tiring) insistence that he and his wife never saw a badly dressed Italian—or a fat one—to his second-rate tour-guide rhapsodies over the Pantheon, Doerr never lets a bromide or a platitude get away from him. When a Roman waiter makes him and his wife wait 90 minutes for their dinner check, Doerr’s only reaction is to go all dewy-eyed over how “relaxed” and “laid back” people are in Italy. Please, Anthony. The waiter was rude. There’s no great mystery to it. It happens all the time in Italy, especially to tourists, especially in Rome, and especially to people who are willing, as the Italians say, to fare il fesso—that is, let someone else make an a** of them. Gird your loins as well, Gentle Reader, for page after darling, cooing page about the marvel of Doerr’s one-year-old twins and for detailed descriptions of just how darn difficult it was to try to wheel them around Rome in a double-stroller that I can only imagine was a special treat for all the people who had to contend with it on buses, down sidewalks, and in museums. But let’s give credit where credit is due: Doerr’s prose is pretty, even poetic. The trouble is, that’s often all it is: a Fabergé egg, a festoon, the rich-and-creamy icing on a cardboard cake. In his 220-plus pages on Rome, there’s almost no there there. (Don’t be misled, either, by the subtitle’s promise of information about “the Biggest Funeral in the History of the World”; Doerr didn’t actually attend, and most of what he knows about it he saw on television.) In more than a few passages, he gets so carried away making perfect little netsuke sentences that he forgets he’s supposed to be transmitting actual meaning in the process. Yes; I admit it. I have a bone to pick: Doerr has nothing particularly interesting, profound, insightful, or new to say about Italy. That sure didn’t keep him from getting a book contract, however, which suggests that attending the right cocktail parties is a sure shot to success. Merit, while appreciated, is not required. And *Four Seasons in Rome* is yet more evidence that, when it comes to anything with the word “Italy” stamped on it, the American public is all too willing to fare il fesso. A veces los libros te eligen a ti y no tu a ellos. Es lo que me ha ocurrido con esta pequeña joya de Anthony Doerr. Si no hubiera leído antes "la luz que no puedes ver" (que tras leer este libro tengo claro que no hubiera sido igual sin esta experiencia del escritor en roma)y casualidades de la vida me encontrara con este libro justo después de leer "spqr" de mary beard seguro que aunque hubiera aparecido en mi camino habría pasado de largo. El libro son las memorias del año que pasó el escritor viviendo en Roma gracias a una beca justo con sus hijos gemelos recién nacidos lo que hizo que su familia se embarcara en esta aventura. Me ha servido para ratificar lo buen narrador que en Doerr y ya me quedo con las ganas de seguir leyendo sus otros libros. Para los que vayan a visitar la ciudad eterna les recomiendo su lectura antes del viaje porque van a descubrir lugares de la ciudad por los que pasar y a los que ya hemos tenido la suerte de estar Doerr con su manera de unir las historias del imperio romano , con la roma renacentista y la vida de los actuales romanos consigue que nos den ganas de volver a pasear por sus calles. This was SO thoroughly enjoyed. Not only for the "new eyes" to Rome but also for the total Doerr grab to what infancy care feels like for a parent. In this case first time parents and also for multiples, twins.But believe me, when you have an endless screamer or have them in steps less than 18 months apart, there is little difference. I absolutely adored that closet room they rigged up in that tiny Rome apartment so the screamer could have his dark. He also completely "gets" insomnia. The variety that sits life-long in some of us from earliest to latest days. People who have no tendency or periods of this which they surmount- they really have little idea. I loved how the more he'd try the farther the shore "got away". Oh YES!But the flavor of the food and life with those babies which caused reaction in so many everyday Romans! He should have made more friends and had some continued conversations- and he DID realize that fact at the end.His poor wife had it MUCH, MUCH harder than he did. I'd LOVE to hear her report in a like manner to this little book, about 7 or 8 months after their return home. SO many reasons, and hope she is well. This was a great read - thank you Anthony Doerr for winning the award that gave you a year in Rome with your wife and babies! I definitely connected with this little memoir as I was totally soaking up the imagery and play by play in anticipation of being in Rome in about a month! I also related so well to the exhaustion of little baby boys! I loved the insight and pondering....how we view such "old world or "old history" in this modern digital society. And now I have a little bit better understanding of why and how it took you so long to write The light We Can Not See, you gave a few glimpses into how you were preparing to write it, very interesting! I also have a better insight into your writing - it is heavy on the imagery and description - I can see how that worked for me in this book and was a little harder for me in your other best selling fiction novel. Readers definitely pick this up if you want to transport yourself into the daily life in Trastevere, the exhaustion of twin newborns, the Pantheon at Christmas, the dying and re-electing of the Pope and various other things that happen throughout the 4 seasons. Anthony Doerr received a writing studio for one year in Rome as part of an award he won. WOW. So he packed up his newborn twins, his wife and spent four seasons in Rome. The man has a way with words whether he is writing fiction or nonfiction. He writes beautifully which is one of the reasons I loved his book "All the Light We Cannot See". I enjoyed the descriptive quality of his writing and I enjoyed his passion, not only for his writing and his family, but for all of his surroundings. LOVE LOVE LOVE LOVE LOVE this book!The diction of the novel just feels so right and natural to me. Doerr is a true artist, knowing exactly how to blend a combination of words to make you stop and stare (and envy his talent). I read this book every time I want to get myself in a writing mood. His craft is undeniable. A must read for every writer that loves the sound of words and the compelling images it creates. The day his wife gave birth to twin boys, Doerr found out he won a fellowship he hadn't applied for: a year in Rome with all expenses paid so he can write. Six months later Anthony and Shauna, Henry and Owen, leave Boise and move to Rome. He lives in the same neighborhood Julius Caesar lived and sits in the garden where Galileo sat. Ponder that! The book he was preparing to write was All the Light We Cannot See. [Now that he's moved to Paris, I'm kicking myself for not driving a few hours to Boise for one of his readings. ]Doerr's book intersects with some of my highest interests: family, travel, the daily life of an author. It won 5 stars because of the wonder-infused writing, a blend of N.D. Wilson and Frances Mayes. Quotes:"Rome is a broken mirror, the falling strap of a dress, a puzzle of astonishing complexity. It is an iceberg floating below our terrace, all its ballasts hidden beneath the surface. ""I x-ray sentences, I claw away a paragraph and reshape it as carefully as I can, and test it again, and peer into the pages to see if things in there are any clearer, any more resolved. Often they are not. But to write a story is to inch backward and forward along a series of planks you are cantilevering out into the darkness, plank by plank, inch by inch, and the best you can hope is that each day you find yourself a little bit farther out over the abyss. ""I try to shape a few sentences around this tiny corner of Rome; I try to force my eye to slow down. A good journal entry—like a good song, or sketch, or photograph—ought to break up the habitual and lift away the film that forms over the eye, the finger, the tongue, the heart. A good journal entry ought be a love letter to the world. "“Without habit, the beauty of the world would overwhelm us. We’d pass out every time we saw— actually saw— a flower. Imagine if we only got to see a cumulonimbus cloud or Cassiopeia or a snowfall once a century: there’d be pandemonium in the streets. People would lie by the thousands in the fields on their backs.”"In the States, practically every time someone would stop us on the street or in the grocery store, they'd gesture at the stroller and say, "Twins? Bet you have your hands full." They'd mean well, of course, but to be reminded of something you can't forget is debilitating. I prefer the Italian mothers who lean over the stroller and whisper, "So beautiful," the smiles of passing children, the old Roman who stopped us today and grinned at Henry and Owen before shaking my hand and saying, with a bow, "Compilmenti." My compliments." This book gave me a lot of mixed feelings. I was looking forward to reading a book set in Italy, and of course reading about other people's sleep and parenting woes is one of my hobbies. Once I started reading, I was pleased at how well-written it was. And I think a special award should go to anyone who pens lines such as, "Trying to dress [the twins:] after a bath is like trying to put pajamas on a mackeral" or "This, I suppose, is what it means to look after two babies: any attempt to make you feel as if you were at the center of something is hopelessly hilarious. "As Pee Wee Herman, noted, though, everyone has a big BUT. This book was, for the most part, a collection of random, poetic impressions. Not only did that wear thin as a concept, but the whole wide-eyed wonder of the book seemed rather strained. I mean, it was written in 2007. Isn't the country bumpkin abroad in Italy a bit outdated? I was consumed with curiosity about the details of what Doerr's wife was doing all day, living in a country where she knows no one, doesn't speak the language, and is attempting to parent infant twins. All this was missing; instead we got way too many still lives of Roman bakeries and crowds and starlings.And then there were lines like this: "A spring night is a power that sweeps through the crowded sheaves of blooming tulips and pours into your heart like a river." That line alone would knock a star off a review. After receiving the Rome Prize from the American Academy of Arts and Letters and with that prize a one-year, expense-paid opportunity to live and write in Rome, Anthony Doerr was off to Italy with his wife and their newborn twin sons. As a new parent, he confesses not to have made much headway with the novel he had hoped to work on during his time abroad, but we gained the gift of this unforgettable memoir, Four Seasons in Rome. It is a breathtaking book of mesmerizing observations and heartfelt musings on the indoctrination of parenthood during his time in one of the world’s most unfathomable cities. 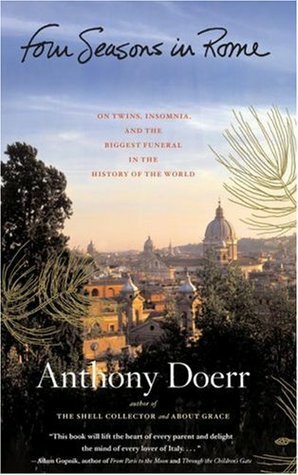 Doerr captures the splendor and spectacle that is Rome. Every page resonates with ecstatic beauty. The entire book feels like a lovely poem or an addictive song that plays in your head with the chorus of pure emotion. In offering up reflections on life, family, and the city, Doerr's prose fascinates with its gorgeous imagery. He makes your heart feel fuller with life and your mind bigger with wisdom. I found the book to be a rush of inspiration. Having read everything Doerr has published, I feel confident in saying he is a great American writer, among the best of his generation. An engaging, warm and personal account by Anthony Doerr of his one-year experience living in Rome with his wife and twin boys – six months old at the time of his move. In poetic prose that vividly brings the city to life before your eyes and makes his experiences the reader’s experiences, Doerr relates what it’s like to supplant oneself from the familiar regularity of a Boise, Idaho life to the vibrant, historical, foreign and vita dolce of Rome, where navigating a stroller and the simple task of ordering a sandwich are confusing challenges. I loved Doerr’s beautiful descriptive writing, the ease with which his words flow -- bringing the reader intimately into his everyday life, his deep appreciation for Rome’s treasures and his entire embrace of living the experience during his four seasons in Rome. A wonderful read and highly recommended. This is a memoir without a particularly profound story or driving sense of purpose--it works mainly because Doerr is an excellent writer. I enjoyed it for the appreciation of the craft as much as what he was actually writing about. But I did enjoy his sense of wonder, his observations of the ordinary/extraordinary in both Rome and parenthood. I'm sure I liked it better because I've been to Rome and have survived the newborn stage of parenthood (albeit not with twins and not in a foreign country! oh my!). This is so very beautiful to read: about Rome, about being a new parent (to twin boys), about being in Italy for the first time, about writing and how to write. Doerr does all of this at once, in sentences you can practically taste and with a rush of sensuous description about everything from baby gear to street aroma. Luscious. I LOVED this book!! The author described so perfectly the beauty, rawness and frustrations of Italy. From the crazy bus schedules- or lack-of-bus-schedules to the smell of the concrete after the rain, Anthony Doerr knows how in one sentence capture the true essence of Rome- the "eternal city" If you haven't yet had the Italian experience, you will be one step closer after reading this book. As I began this book I wasn't sure how I felt about the author's fragmented writing style. I say fragmented because of his constantly presently random facts, yet it flows so marvelously that the word 'fragmented' hardly applies. I couldn't stop turning the pages. How do I describe this guy's writing?? I was completely sucked into Doerr's experience of Rome. He painted pictures in my mind of the majestic edifices and the crumbling ruins. I could feel the cool of the dark churches and the heat of the Roman summer. I could hear the din of traffic and taste the fresh vegetables and pastries. (Seriously, the food in this book sounds incredible and it's all so painfully out of my reach.) It's wonderfully evocative. There is plenty of musing on the meaning of life and all that jazz, yet he retains gravity. He has a sense of humour that lends humility to his writing. In the end, I really enjoyed it. (Except for some of the parts where he talks about his kids. I adore children but I can't stand hearing about kids whose parents exercise little restraint over them.) As an added bonus it's also a very quick read. Recommended. 3.5 a lovely travelogue, and Doerr's writing is beautiful, as always. A great follow up to reading All The Light! I loved this book, for taking me back to one of my favorite cities, and for making me feel that I was in Rome as he described his local encounters and enchanting and mesmerizing descriptions of the chaotic city. Books don't often take me back or to a place, and for that, this book was great. It's also short & easy to read, with a very interesting premise. It's the true account of Anthony Doerr, who finds out on the day that his twins are born, that he has been given a grant to study basically whatever he wanted in Rome for an entire year. You can feel the hot humidity of their summer in the city with no air conditioning, and his amused yet touching recount of "The Biggest Funeral in the History of the World" (he was there when Pope John Paul II died), as he and his wonderful wife stumble through their first year raising their babies in the Eternal City.I loved it--buy it if you're dreaming of Rome, on your way to Rome, or in any way interested in Rome (or raising babies!). I have mixed feelings about this book. On one hand I absolutely adored the descriptions of Italy described throughout the novel, it set a beautiful tone for the entire book and I almost rated it four stars from that alone.But on the other hand I found this book pretty hard to follow. I can understand that to a point, as it is a memoir and I found the jumps rather disorienting as was the seemingly random bits of description that appeared to have no place other than to describe the novel.I gotta admit though, I did pick it up because of the author as I adored his writing style in All the Light We Cannot See so I can't say I was disappointed there.Unfortunately for me though, I found it lacking in other areas. I definitely don't regret reading it - don't get me wrong, it just isn't one I have plans to put on my shelf. I simply loved everything about this book. I loved Doerr's book, All The Light We Cannot See, his writing style is incredible. This autobiographical book about his year spent at the American Academy in Rome with his wife and newborn twins was so beautifully written. His descriptions not only of navigating a new city and a foreign language but also their experiences of first time parents of twins was so incredibly insightful. The layers of beauty, hardship and irony are so well articulated. I learned so much about Rome in this book (I have never visited) from his observations. But at the same time I appreciated his acknowledgement of where his experiences fell short and his regrets about what he wished he had done. I highly recommend this book, especially for folks who enjoy travel writing. Part of the reason I like this book so much is that it is written by someone who lived for a year in Rome (like we are currently doing), with infant twin sons (his were 6 months when they arrived; our little one was 11 months). He was at the American Academy in Rome which is in our neighborhood, so the places he describes as part of his daily life (fresh pasta place, bread shop, supermarkets, parks) are our places, too. Beyond the similarities to my year in Rome, it is a very nice meditation on Rome and Italian culture written during the year Pope John Paul II died. Another point in its favor is that it is not another installment in the I-had-a-midlife-crisis-so-bought-a-villa-in-Tuscany-and-here-is-what-I-learned-about-Italy-in-the-process genre. I never thought I'd say this but after reading a few of those "expat" books on finding the perfect house in Tuscany and showing Italy in a way that is very cliche, I wasn't sure I'd like this book. But Doerr won my heart with his prose! He can capture moments through his words. It felt like I was right there with him...he has weaved a few months in Rome so beautifully despite the twin struggles that I have to say I have fallen in love with Rome all over again! Tony Doerr is amazing. The next big thing. This book is smart and escapist all at once. If you love his writing you'll love his other book of short stories, The Shell Collector. Also, he's a nice person. Anthony Doerr - Anthony Doerr is the author of five books, The Shell Collector, About Grace, Memory Wall, Four Seasons in Rome and All the Light We Cannot See. Doerr’s fiction has won four O. Henry Prizes and has been anthologized in The Best American Short Stories, The Anchor Book of New American Short Stories, and The Scribner Anthology of Contemporary Fiction. He has won the Barnes & Noble Discover Prize, the Rome Prize, the Story Prize, the New York Public Library’s Young Lions Fiction Award, a Guggenheim Fellowship, the Sunday Times EFG Private Bank Award, and the Ohioana Book Award three times. Doerr lives in Boise, Idaho. Become a fan on Facebook and stay up-to-date on his latest publications.